Presenting... an afternoon concert of intimate music in the Black Box Theatre featuring Witches Leap (Blue Mountains), Virago and Clinton Hoy (Dubbo). 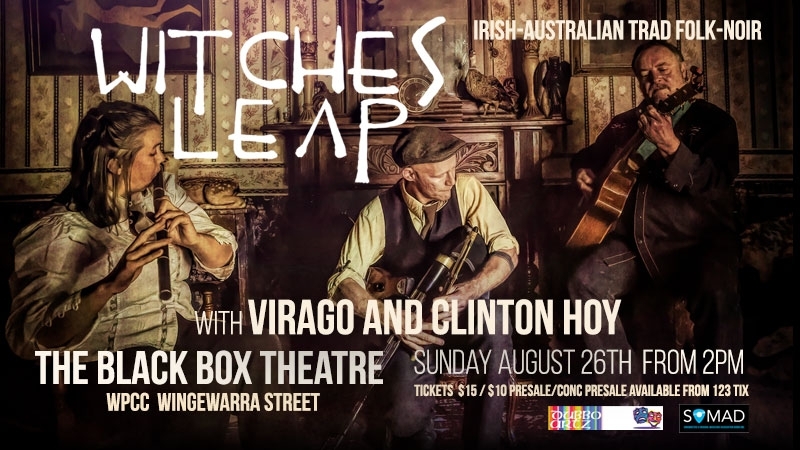 Witches Leap take the rich tones of uilleann pipes, wooden Irish flute and bouzouki, and blends the dark modal sounds of old Ireland, with original tunes and folk-punk inspired songs from the hanging swamps of County Katoomba. Kath Morgan and Di Clifford are known in folk music circles as Virago. They have been performing locally and at folk festivals around NSW for 25+ years, delivering celtic songs, parodies and more. Clinton Hoy is a supremely talented and driven local musician whose current project is a collection of beautifully crafted songs collected as Pieces of Different Puzzles. This performance is presented in the Black Box Theatre. Located upstairs in the Community Arts Centre at the Western Plains Cultural Centre, this raked theatrette is the perfect setting for intimate, live music. Tickets $10 presale/concession or $15 at the door. Proudly brought to you by Dubbo Artz and SOMAD (Songwriters & Original Musicians Association Dubbo Inc.).